Traveling all over the world is what we love immensely, but we never travel in the summer. One reason for it is that we have absolutely no chance of flying on stand by, and we don't want to spend holidays in the airports. The other reason of equal importance is that summer is reserved for my favorite island on the most beautiful sea - the Adriatic. 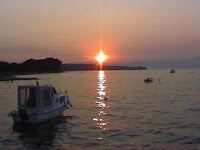 Krk is the second biggest island, and also the greenest one. Malinska is a typical tourist resort, proud of its more than a century-old touristic history. There are other little towns on Krk, that boast even longer history of influential Croatians and significant events. The most important is the Baska slab, the oldest example of the Glagolitic script and the first document where the name Croatia can be found. It dates back to the 11th century. The historic part of Baska with its narrow stone paved streets is what I like most. Such romantic old parts can also be found in the towns of Krk, Vrbnik and Dobrinj. They are all just perfect for an evening stroll after a long day on the beach.